San Antonio, Texas – Over the last year, Indatatech, BAE Systems, and George Mason University (GMU) have been partnering in a US Army funded Department of Defense (DoD) Mentor-Protégé Program (MPP). For 25 years, the MPP encourages major DoD prime contractors (BAE Systems) to assist small disadvantaged businesses (Indatatech) to develop our technical and business capabilities to allow us to successful compete for prime and subcontract awards. BAE Systems, headquartered in Nashua, NH, has a successful supplier relationship with Indatatech since 2005. The two companies approached the US Army over two years ago to propose a successful award of a Mentor-Protégé partnership. A part of each MPP partnership is a Historically Black College and Universities (HBCU), Minority Institution (MI) or Procurement Technical Assistance Center (PTAC) to assist in the transfer of technology and developmental training. GMU is this partnership’s PTAC. 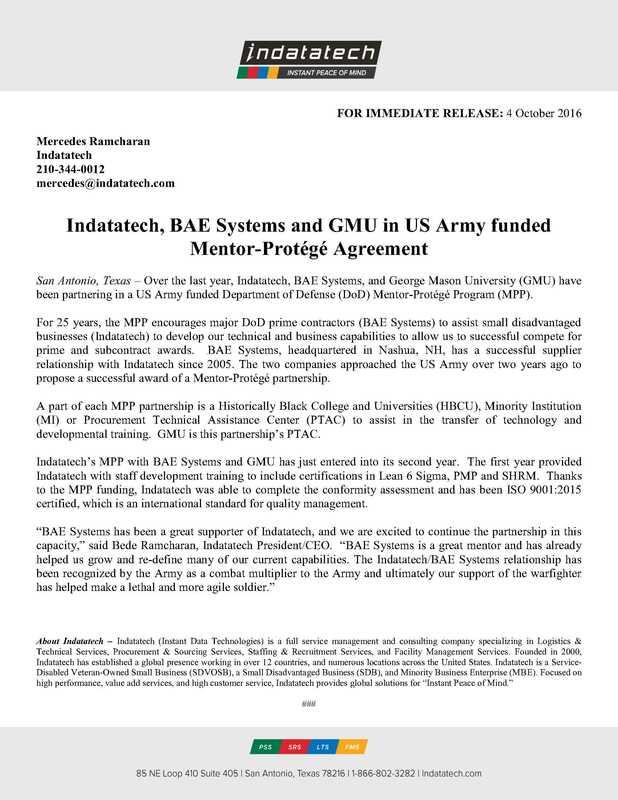 Indatatech’s MPP with BAE Systems and GMU has just entered into its second year. The first year provided Indatatech with staff development training to include certifications in Lean 6 Sigma, PMP and SHRM. Thanks to the MPP funding, Indatatech was able to complete the conformity assessment and has been ISO 9001:2015 certified, which is an international standard for quality management.